Sophistication and style are qualities not often associated with aluminium trailer boats, but as Trade-A-Boat discovered, that's all about to change with the release of the new 8m Cruiser from Gisborne's White Pointer Boats. 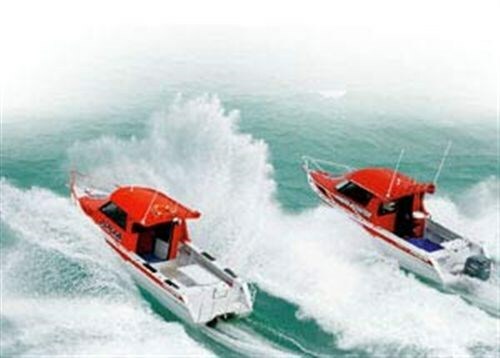 Having tested a good number of quality alloy boats in a variety of sea conditions I can confidently say that there is little difference in terms of strength, build quality and ride between our top alloy boat manufacturers. Builders, of course, would argue differently, correctly pointing out design features and extras unique to their own designs. Obviously no two models or designs are the same, but top-of-the-range buyers can reasonably expect a quality product backed by a minimum five-year manufacturer's warranty. This provides peace of mind for buyers, but it also creates a conundrum in terms of deciding which boat to buy. Price will ultimately play a leading hand in any sale, but the margin between our top builders products is smaller than you might think. 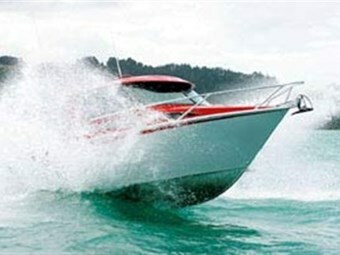 Increasingly, therefore, buyers are being influenced by look and functionality and it is in this area that alloy boat manufacturers are making their greatest strides. While it was once enough for a manufacturer to deliver a no-frills, albeit bullet proof fishing platform, buyers now demand a boat that looks good and provides at least a minimum of creature comforts. 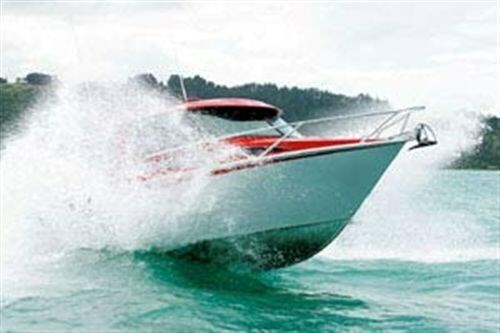 Alloy boat manufacturers have proved beyond doubt that a well designed and well-built hull is every bit as good as its fibreglass equivalent. Manufacturers, however, still have a way to go to match the overall level of finish achieved with fibreglass boat production. Although it is quite inappropriate to compare the two, the divide between alloy and fibreglass has narrowed to such an extent that it can be difficult to determine one from the other. Working hard to further bridge that gap is Gisborne's Rex Briant, whose White Pointer range of trailer boats has set a benchmark for look, finish and versatility. White Pointer boats has established a loyal following in the 12 years since Briant began manufacturing custom-built fishing boats principally for rugged East Cape conditions. A diesel mechanic by trade, Briant moved into alloy boat construction soon after completing his apprenticeship, landing a job as a fabricator/welder with a Canadian company building 6m to 9m vessels. The work was challenging and at the forefront of manufacturing technology. Products ranged from jet-powered racing boats to commercial vessels for seismic exploration. Briant returned to New Zealand in 1989 and initially put his skills to work designing and building jet sprint hulls - one that took his brother Peter all the way to the top of the World Jet Sprint Drivers Championship. While White Pointer hulls are revered on the US racing circuit, it is the open waters off East Cape that the White Pointer brand has established a loyal following among "Cape" fishers. Unlike some builders, Briant did not automatically assume the role of designer for his fishing boats, commissioning naval architect Terry Reid to draw his early hull shapes. "Building boats was a long term proposition and it was critical to our success that we got it right from the start. I wanted to create a boat that was a cut above the competition - a hull based on sound principals and a boat truly capable of handling East Coast conditions," he says. That was some time ago and White Pointer designs has evolved with time and technology. Today there are more than 300 White Pointer boats on the water, ranging from the entry-level 6m open cuddy to the top-of-the-range 8.8m enclosed hard top. The latest release and the subject of this review is the new 8m Cruiser - a package that encapsulates White Pointer's latest thinking on the future of aluminium hard top design. The 8m Cruiser shares the same hull as the standard 8m hard top - the model that won Aluminium Fishing Boat of the Show at the 2001 Hutchwilco New Zealand Boat Show. The Cruiser, however, has a new deck and hard top design and features a highly appointed interior. The changes reflect an emphasis on comfort and an ability to weekend-cruise with family and friends. It is here that aluminium boat buyers have been let down in the past with manufacturers concentrating solely on coastal and offshore fishing ability. Briant says there were times during the development of the Cruiser that he wondered whether he was putting too much emphasis on comfort given White Pointer's traditional reputation as a serious sportsfisher. "I agonised over the Cruiser. I did not want the boat to signal a change in company direction or risk alienating our client base. I simply wanted to raise the bar in terms of look and comfort. The boat has the same hull and the same cockpit layout as the standard 8m hard top design. The only real difference is the Cruiser's ability to cater for family which, to my mind, is a win-win scenario for everyone." That said, the Cruiser has a softer, more rounded look than the standard 8m design. This is largely due to the imported US wrap-around tinted windscreen that gives the boat a true production look. The boat also features a hinged bi-fold aluminium hard top door as opposed to the sliding door on the 8m. This has allowed Briant to introduce a cockpit window on the port side that slides down into a recess in the bulkhead. This effectively opens the cabin and the cockpit, giving a greater sense of space and improved visibility through the rear of the cabin. The other major change is the position and layout of the anchor winch and chain run. This is recessed into the forward deck and again lends to the Cruiser's production-look. White Pointer Boats are not afraid of using colour and the Cruiser is further proof that carefully applied two-pot paint can do wonders for the overall look of a boat. The Cruiser, with its Nyalic-silver topsides and fire engine-red superstructure, is a very sharp looking package indeed. The Cruiser cabin features a dinette to port with a bench seat set across the aft bulkhead that provides comfortable seating for two. The dinette table is set on a plinth and can be lowered to form a full-length berth. Opposite to starboard and directly behind the helm station is the two-burner cooker. This is set into a cabinet with double opening doors and secure storage for cooking utensils, plates and cutlery. When not in use, a solid timber top fits snugly over the cooker. This can be used as a seat or general storage while at anchor. The Cruiser provides full-length berths for four and includes a cunning canvas pipe berth set above the vee berth on the starboard side. Although common on racing yachts, this is the first I have seen on a trailer boat. The pipe berth serves two purposes - a spare berth and, more importantly, a secure place to store personal gear and equipment when using the upholstered vee berth for overnight accommodation. When not required, the berth simply rolls up and fits snugly into one of the cabin's four parcel shelves. There are many tricky fittings on the Cruiser, including rod holders recessed into the forward cabin bulkhead. This allows rods to be stowed against the cabin top and locked safely away while the boat is on the trailer. In keeping with the Cruiser theme, Briant has installed a full-size electric head (toilet) between the vee berths which, when not in use, is hidden away by an infill squab that forms a double berth. Cabin access can often make or break a boat's overnight potential and appeal and this is one area where the Cruiser excels, with an extremely generous three-quarter bulkhead opening that further adds to an overall feeling of space. This is enhanced with natural lighting from an overhead Weaver hatch and small polycarbonate side windows. The cabin is nicely lined and lit and has generous leg and sitting headroom. There is ample dry storage under both the dinette bench seat and passenger seat as well as under the vee berth squabs. My only complaint is that the passenger seat, unlike the drivers seat, does not have a solid footrest. This is because there is no cabin bulkhead on the port side and thus nowhere to mount a rigid support. The seat does, however, have an upholstered chest-height brace that doubles as a backrest when the passenger is facing the galley table. But, for my money, the seat requires something a bit more solid to brace on when battling the rough stuff. That said, the overall standard of internal finish is excellent and driver visibility is the best I've encountered. The imported Taylor windscreen is set into matt-black aluminium mouldings and gives the boat an undeniable X-factor. The bi-fold hard top doors fit well and fold back neatly, but do restrict access to the forward under-floor fish bin. The Cruiser's showerhead is mounted under the hard-top overhang on the starboard side and features a sink unit with single faucet mounted on a half-round corner unit housing the gas califont and plumbing systems. The cockpit is true to its sportsfisher heritage and has a solid chequer plate sole with full-length large parcel shelves on each side. The batteries, switches and pre-lube are housed in a watertight unit, which is set well above the sole against the transom and serviced through twin Sopac plastic hatches. The dive platform is boarded from the starboard side and has a reasonable step up to the bridge-deck to prevent backwash finding its way into the cockpit when reversing at speed. There is good underfloor storage and a live bait tank each side of the outboard well. White Pointer construction begins with the laying of two full-length floor to hull girders, keel bar, six stringers and a unique gunwhale extrusion that capture the topside panels. Transverse frames are then positioned on 750mm centres. The bottom panels are pulled down to the jig and welded to the girders, stringers and keel bar. The stringers are then alternately welded at 100mm intervals each side to prevent distortion during the weld process. The Cruiser hull has a single flat chine that progressively tapers from 100mm at the stern to nothing at the bow. With 18 degrees of deadrise at the transom and a very fine entry, the Cruiser is perhaps best described as a moderate hull form, making her sea-kindly yet relatively stable at anchor. Test day was testing indeed with a two-metre swell, confused seas and a strong on-shore wind that made conditions off Gisborne bouncy, to say the least. We had initially planned to take the Yamaha-powered Cruiser and her Volvo-powered sister ship Julia to Young Nicks Head, but this was abandoned after rounding the breakwater. Gisborne is well known for producing seas with plenty of "holes" and it became quickly evident that we could forget any notion of carrying out speed trials. Despite the conditions we pushed on at 12-18 knots, rising and falling with the swell sweeping into the bay. Although conditions made life a little uncomfortable for us, the boats made light of their work, responding instantly to throttle and trim as we powered on, then off, picking our way out to sea. There was the odd heavy fall, but things were remarkably quiet and dry in the cabin despite the rivers of spray cascading over our windscreen. After several hours "mountain climbing" we turned both rigs around and headed for home, surfing at speed as we leapt from sea to following sea. For some reason running before makes me feel vulnerable in a trailer boat, but with my legs well braced and both hands firmly on the wheel I felt strangely at ease as we powered towards the distant horizon. With the leg trimmed in, the Cruiser tracked straight as a die, happy to run at 20 knots and surf off at close to 30. 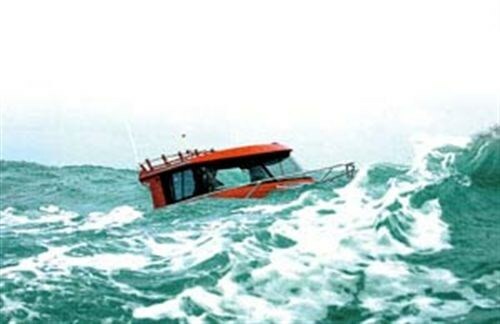 Fortunately, Briant has a mature attitude to safe boating and had no desire to head back out to sea to prove just how forgiving his boats can be. Happy to call it a day, the only remaining task was to trailer the boats. With a towing weight approaching 3000kg, the Cruiser is no lightweight and I felt more than a little anxious when left in charge of the boat while Briant collected the trailer. The trailer in this case was custom-built by White Pointer Boats and did not have a roller on it. The boat, instead, sits in a cradle of nylon strips that centre the boat as it's driven on. Despite my fears, the boat slid on effortlessly and was hooked up and rolling within a matter of minutes. All up, the new Cruiser represents a top quality package that further bridges the gap between a dedicated and capable fishing boat and an all-purpose pleasure craft. The level of comfort and onboard amenities are representative of a small launch and will ideally suit buyers looking for a boat equally adept at family summer cruising or blue-water competition sports fishing.